Like it or not, believe it or not, incoming Democratic administrations have historically not been as bad for the markets as many would like to think. As stated by Jeffrey A. Hirsch, editor of Nyack, New York-based Stock Trader's Almanac, in a recent interview with U.S. News and World Report: "For the record, there have been 14 recessions and 18 bear markets under the Republicans and seven recessions and 16 bear markets under the Democrats." "Since World War II, Democratic presidencies averaged an 11.2 percent gain in the S&P 500, versus a 6.3 percent gain for the Republicans," says Sam Stovall, managing director of U.S. equity strategy at New York-based S&P Capital IQ. Before anybody gets up in arms over the presumption that Democrats are good for the economy, however, I would like to add that these bull markets weren't necessarily products of Democratic policy or ideology. Sometimes, as in the case of FDR, it was World War II that brought the U.S. out of the worst of all the economic downturns — the Great Depression. But the fact remains, when a Democrat takes the White House, markets do move... And with Hillary's success now all but guaranteed, serious investors are preparing for bull markets in the following industries. Democrats are big on alternative energy, that's not news to anybody. And yes, she's put forth a plan to do just that. In June of 2015, she stated that as president she would set the nation on a course to power all homes with renewables by the year 2027. 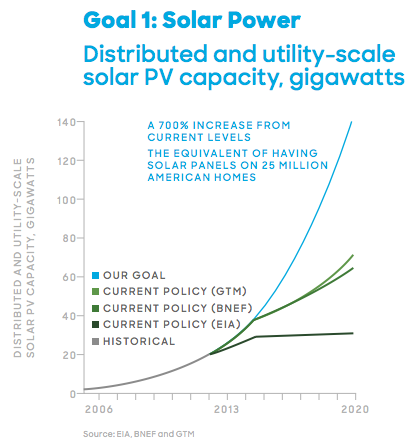 This promise means that by the end of her first term, more than 500 million solar panels would need to have been installed for a total output increase of more than 700% by 2021. If that sounds like a bull market, it's because it is... And it will come with billions in federal funding, which means that profitability will be a secondary concern. SolarCity (NASDAQ: SCTY) is a great example of an established company that's nevertheless looking at major long-term growth potential. At $3.7 billion market cap, this is far from an early-stage company, and it already boasts a compound annual growth rate of 120% over the last three years. However, with Clinton's play to expand total output by 700% by 2021, you can believe that companies just like this will be enlisted to do the heavy lifting. SunPower Corporation (NASDAQ: SPWR), at $2.9 billion market cap, is another — albeit with a different niche. SunPower boasts the most efficient solar panels on the market, giving them a fundamental and distinct advantage in a field including dozens of aggressive young startups, as well as established old guard corporations. If Hillary's plan is to come to fruition, expect both of these cornerstone players to respond very favorably. In November 2008, Barrick Gold was trading for less than $800/ounce and silver was hovering right around $9. Within two years, gold had more than doubled to more than $1800/ounce, while silver went on an even more impressive rampage, topping out at $45/ounce — close to five times where it was on election day. The odd thing is, while this was happening, the markets were rallying, bouncing back from the 2008 dip for one of the greatest turnarounds in history. Precious metals typically don't rally like that during massive bullish trends, but they did here, and for a very specific reason: there were enough investors who thought that the worst was yet to come. One of their main concerns, national debt, remains a concern today — in fact, it remains a growing concern, and the way Democrats tend to spend money, this won't change when Obama's replacement is in. And you better believe those investors are still around; still watching that debt clock; still waiting for gold to recover its losses of the last few years. The closer we get to zero hour on November 8th, 2016, the antsier this crowd will get. Add to that the fact that Hillary has already promised to revise the definitions of 'long-term trading', thereby eliminating many of the tax benefits that wealthy investors use to minimize their exposure to the IRS, and you get a near perfect storm. Whether they're paranoid or just plain annoyed, investors will start moving into precious metals more between now and the first year or so of the next administration — until they get a better idea of what to expect in the longer term. Barrick Gold Corp (NYSE: ABX) is a good, not to mention safe, bet if you want to beat this trend. Not only is it stable in size, at $8.7 billion market cap, but its mines boast the highest ore grade of any of its major competitors. That, combined with a relatively low AISC (all-in sustaining cost), and Barrick's 6.5 million ounce production rate for 2015 makes this stock behave more like a Gold ETF. It should also be noted that its stock is at 20-year lows right now — just waiting for that catalyst. Another big, and equally depressed, gold stock is Goldcorp Inc (NYSE: GG). Falling costs have made this $9.5 billion miner/producer more attractive in 2015, but that still hadn't stopped its shares from falling to 12-year lows. Just like Barrick, this one is just waiting for the right event — which it may well get come November. As much as they like renewables, or at least talking about them, Democrats also like gun control — or at least talking about it. However, when it comes to certain stocks, talking by these figureheads is enough. It's been said that Barack Obama, who has made a routine out of going on TV and calling for expanded gun control provisions after every incident involving a semiautomatic weapon and a lunatic, has done more for the weapons industry than any other president. And in a way, it's a fact. Whenever he calls for more gun control, shares of gun and ammunition companies rally. Today, thanks to the rhetoric, there are more guns in the U.S., per capita, than ever. Whether or not mass shootings become less prevalent under a Hillary Clinton administration, more calls for, and steps toward, tighter gun control will be a popular topic. Which means the other side of the political spectrum will react by stockpiling, and those shares will again rally. Want evidence? Just take a look at shares of Smith and Wesson (NASDAQ: SWHC) in 2015. Up more than 100% between January and December, this stock is just a microcosm of the entire gun debate in America today. The more one side pushes, the more the other side buys... And that's only going to escalate moving forward as gun control will inevitably come up again and again in debates, speeches, and town hall meetings. Ultimately, however, rhetoric will have to become policy, and that's really where the rubber will meet the road. Olin Corp, (NYSE: OLN), owner of the legendary Winchester brand, was hit hard in 2015, turning it into a bargain. However, Olin is a diversified chemical company, with only one of its three major branches focusing on the gun market. If you want a more direct approach, Sturm, Ruger and Co, Inc (NYSE: RGR) offers an excellent name, a rich history, and a stock which hasn't seen quite as much investor mania as Smith and Wesson. Demand for Ruger's products, especially their line of semi-automatic hand guns, is only expected to grow with the prospect of a new Democrat in the office. So just as the case with Hillary herself, like it or not, the gun-buying trend has clear and substantial market-making potential. Predicting presidential outcomes really isn't my cup of tea, nor is it something we spend much time at all on at Wealth Daily. That said, what we do spend time looking for are those all-important trends, before they, well, start trending. With the political and demographical landscape the way it is today in the U.S., another democrat — and more specifically, another democrat with the last name of Clinton — is all but certain right now. Perhaps more so than ever before, when talking about presidential races not involving an incumbent. Love her, hate her, or dismiss her altogether... What you cannot ignore are the patterns that her policies, and the ideologies of her constituencies, will be driving. Learn to use them now, before this 'prediction' becomes history.